What in the Wide, Wide World of Sports? : What Took Place in Space? These are busy times in outer space. While the first woman space tourist made her way on a Russian ship to the International Space Station, the American shuttle Atlantis was making its way towards space to drop off a 17 ton trussle and two solar arrays for use in construction at the ISS (International Space Station.) The shuttle and the six astronauts on board where scheduled to arrive back on Earth Wednesday, but certain circumstances delayed their return. This morning (9/21), before sunrise, Atlantis touched down to Earth in Florida after a successfully completing their mission. But what caused the delayed return? What were the circumstances that went into Atlantis having to check and recheck their spacecraft 3 times before it was deemed safe for re-entry and a safe landing on Earth? The first glitch in NASA's plan came in the early morning of September 19. Video footage filmed from Atlantis was being reviewed back on Earth when something unusual turned up on the film. There, well below the spaceship, a dark spot was seen moving at the same speed and in the same orbit as Atlantis. This object was deemed a 'mystery object' by the press and by NASA...they did not know what it was. "The object was spotted by a flight controller who was operating the shuttle's payload bay cameras around 2:45 a.m.," a NASA spokeswoman said. 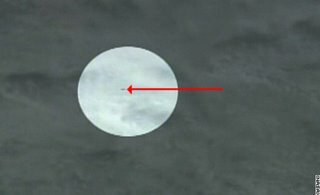 Videotape replayed just before 10 a.m. showed what appeared to be a small object below the shuttle flying at roughly the same speed and in the same direction. "INCO had seen an object in the video during Earth observations and we just want to keep the KU(Atlantis video system) up and possibly downlink more video here in the near term," astronaut Terry Virts called from mission control in Houston. "We're looking at keeping it up overnight." "Ok, that makes sense. Just let us know what you want to do," an Atlantis astronaut replied. "And you don't need OCA router for all that, right? We can go ahead and tear that down?" "We'd actually like to keep the whole PGSC network up," Virts replied. So this object was of enough importance that NASA decided to keep its camera systems up and operational overnight, as opposed to the original plan of taking it down to ready for the return to Earth. Wayne Hale is the NASA spokeman with the responsibility of talking to the public about what is happening in space. Here is what he had to say about the mystery object:"Today, as they were doing that(checking the film), they came across a very interesting object in the field of view," Hale said. "There is a very small black object, which because we moved the camera around a couple of times we know it's not one of those camera lens artifacts, it's not a piece of lint on the lens or a reflection into the camera, which we sometimes see. But there is a very small object in that picture. It is clearly co-orbital with the space shuttle (and thus travelling at speeds in excess of 17,500 km). We took a look at it and frankly there is not enough resolution ... to tell what that is. But it did get everybody's attention." The thought was that the object was a piece of material from Atlantis. Some engineers think it could still be a small piece of plastic inadvertently left between tiles along Atlantis’ underbelly. According to Hale, “We don’t know that for sure, but it is a likely candidate,” Hale said, referring to the bit of orange plastic—known as shim stock—seen dangling from a gap between the protective heat tiles along Atlantis’ belly. The shims are spacers between heat-shield tiles, and one in particular was sticking out quite a bit early in the mission. Obviously a piece of the ship falling off could have potentially catastrophic consequences, so NASA had the astronauts meticulously check the exterior of the ship for damage. This was done using robotic arms and a 50-foot boom camera to visually inspect the ship inch by inch, especially the heat shield. Three such operations were undertaken in a 24 hour period, and none of the scans showed anything out of place on the ship. This would lead one to believe that the piece of debris was not, in fact, from the ship. Before I go on I must say that NASA provides a live feed from Atlantis and mission control on the internet. The live video feed either comes from one of the cameras mounted on Atlantis, or from cameras at mission control, or sometimes just screenshots of charts and diagrams being used for the mission. The feed is supposedly on a one minute delay, for formatting and buffering the feed to stream in through the internet. It was during the time between the first 'debris' sighting and the second that there were some unusual comments coming from the astronauts on board Atlantis. During a noon news briefing by shuttle Program Manager Wayne Hale to discuss the decision to delay re-entry, shuttle commander Brent Jett radioed mission control to report the crew saw yet another object departing the area of the shuttle. "OK, we're not joking about this, but Dan (Burbank) was at window one, he looked out, he saw an object floating nearby," Jett said. "We took several pictures of it, it was fairly small. But we did get several pictures we can send down." "Did you have a time on that?" astronaut Terry Virts radioed from mission control. "It just happened." The pictures mentioned are those seen above. Another quote of interest came from Heidemarie Stefanyshyn-Piper, the only woman astronaut on board. On the live feed from NASA she can be heard saying, "There are a lot of things up here you really can't explain...until you see them." She was speaking after the pictures were taken, but what did she mean by it? Another phrase that was audible before the pictures were taken came from an astonaut on board: "You are going to think I am crazy, but something flew past our window." The final quote of interest came from shuttle commander Brent Jett, who is a veteran of 4 missions to space, spending over 60 days in outer space. Jett tells mission control, "It doesn't look like anything I've seen outside the shuttle." NASA tried to spin off the first sighting of a 'mystery object' as simply debris from the space shuttle itself, or some piece of debris from a previous space mission. While space debris is common, the chance that NASA, NORAD, or any other agency monitoring space would mistake something like this is pretty small. U.S. Strategic Command monitors over 10,000 pieces of space debris on its own. 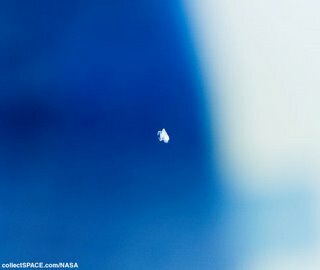 Furthermore, after the Columbia disaster in 2003, what are the chances that NASA just leaves pieces of plastic hanging off their spaceships, or that some piece of material came off it but wasn't important? September 19-20 was a very busy time in outer space. Yet for all the activity there, all the questions, the video and audio clues, the strange occurances...the answers provided by NASA do not measure up. Take for example the second sighting of mystery objects: Would you believe that according to NASA, those pictures show a plastic bag floating through space? 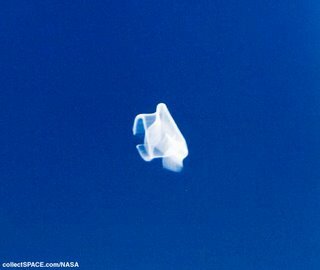 Wayne Hale again gave NASA's explanation for the object, stating that "While we have not definitively put this interesting little picture to bed, there is considerable thought that it is just a plastic bag that came from somewhere and got loose." More speculation from NASA stated that the images were "perhaps a plastic filler strip, maybe a garbage bag." To sum this up: NASA has no idea what the first object is that was spotted, they claim the second object (blue pics 1-3) is a piece of plastic or a trash bag, and they have no commented at all on the third series of sightings. When asked about the debris, Mr. Hale simply stated that there was no structural damage found on Atlantis, and that the ship would be cleared to return to Earth. He steered the conversation away from the debris because NASA has no idea what any of it is. Other conjecture from NASA includes the possibility that the items seen are ice, particles enhanced by the camera, space debris, shuttle junk, or any combination of these things. One point to consider is this: NASA spends years hypothesizing, planning, checking, and double checking the construction of their space shuttles and their spaceflight plans. How can there be so many objects falling off and out of Atlantis? The absolute worst thing that can happen during a mission is that the astronauts do not return to Earth. They have billions of dollars invested in these missions. 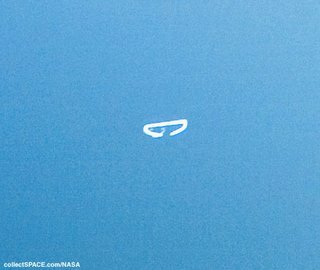 How likely is it, then, to believe NASA when they say that 5 of more unknown objects, viewed through a live feed over the internet from cameras onboard, are simply pieces of the space shuttle that fell off, but are not of any importance? With all the time and money invested, would it make sense for NASA to include unnecessary pieces in the contruction of the ship? To that end, what are the chances that someone dropped a piece of plastic out of the ship or that they misplace a garbage bag. Furthermore, do those pictures even look anything remotely like a plastic bag? The sad part of all this is the media let the story drop, taking a cue from Wayne Hale and NASA. Tuesday morning (9/19), the mystery objects were the top headline on every news website and channel in existence. And even without a believable explanation, the story isn't even included in the mission wrap-up or debriefing. Over the course of about 60 hours this story went from front page headlines to almost disappearing from sight. If you hadn't watched the news on Tuesday or Wednesday, you wouldn't have have even known this was going on. How can that be? I do not know what those objects were in outer space, but neither does NASA; that fact alone should make you wonder about the validity of the claims they make. Most of mankind's information about space is conjecture based on theories that work on Earth. The truth is, we have no idea about anything past the moon, because thats as far as humans have travelled (that we know of). Sure, we have satellites taking pictures of Mars and the moons of Jupiter, but that only tells us about our solar system. That would be like me taking a drive around my town, then claiming that I know and understand every other place and thing on Earth. I'm not sure what NASA knows as compared to what they tell the public, but I have a feeling this week's events will prove significant. Whether or not there is life floating around Earth as I type, I cannot say. I just hope that the public takes what it has seen and heard in the past few days and push it as far as possible.